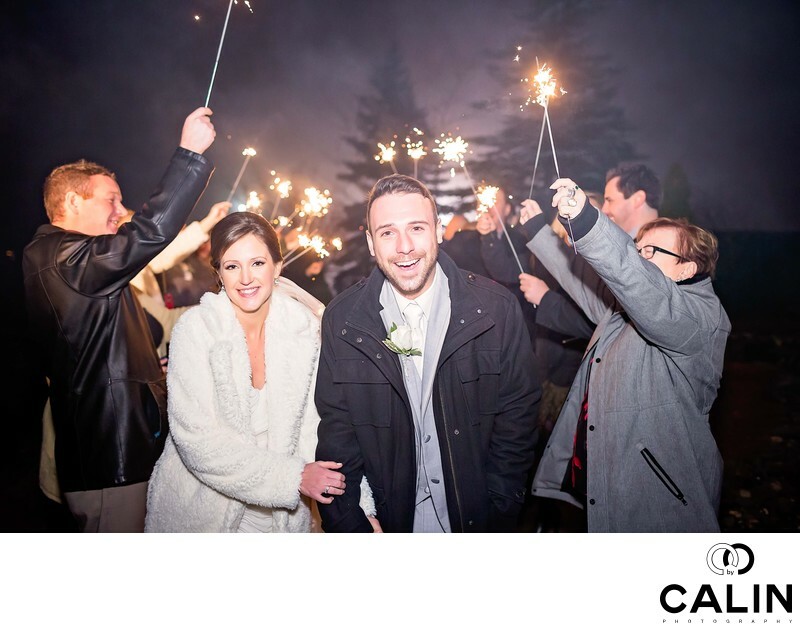 As a Toronto wedding photographer, I don't have that many opportunities to shoot sparkler exits. However for this wedding shot taken at The Fermenting Cellar, towards the end of the reception, the bride and groom announced the sparklers send off. As such, the guests lit the sparklers and the bride and groom exited the wedding venue under an arch of sparklers. To obtain a perfect sparkler shot, the guests lit the sparkers simultaneously and the couple walked under the sparklers twice until I captured the perfect expression. For this shot, my second shooter handheld the off camera light. To illuminate the scene, I used a continuous light placed to the right of my camera. Because the ambient light was almost nonexistent, I used a 35mm f1.4 lens shot wide open. This allowed enough light to enter the sensor so I could capture this beautiful image. Why do I love the shot? Well, where do I start? Is it the bride and groom's expression? Is it the emotion triggered by this image reminding me by my childhood when I used to play with sparklers? Is it the heavy fog on that winter wedding day before Christmas that brings back so many memories? It's all of the above and more. In terms of challenges, this is a difficult shot. The dim ambient light causes the lenses to struggle finding focus. Combine that with the thick fog in the sparklers smoke and you have the conditions for this image to be out of focus. Even more, because I shot this image at f1.4, the depth of field is so shallow that the bride and groom had to be in the same plane the focus. Otherwise, one of them would be out of focus. However, because the bride requested this picture, I asked the couple to take this picture a few times until I was confident I had a good image. Location: 28 Distillery Lane, Toronto, ON M5A 3C4.